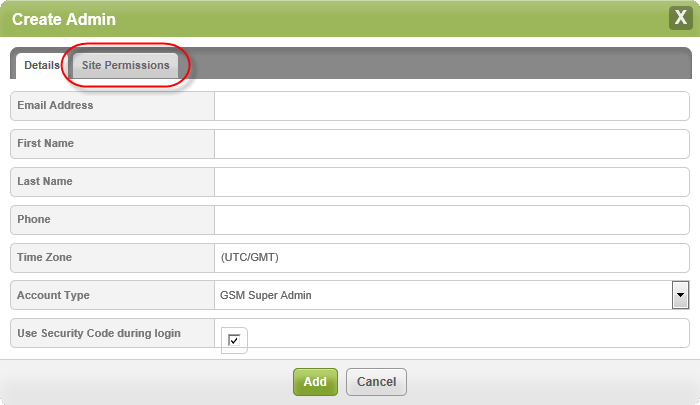 You can add additional admins to the different sites. The system displays the Admins panel. Click the Add Admin button. The system displays the Create Admin window. In the Email field, enter the email of the admin being added. In the First Name field, enter the first name of the admin being added. In the Last Name field, enter the last name of the admin being added. In the Phone field, enter the phone number of the admin being added. In the Time Zone field, click the Pencil icon, and enter the country, region, or major city that represents the appropriate time zone of the admin being added. Super Admin – Can access all sites, and add, remove, and edit admins. View Only – Can only view GSM sites. Site Access Only – Can view the site to which they've been given view permissions. If needed, you can deselect the Use Security Code during log in checkbox to allow users to bypass this portion of the process when they log in. Note: We recommend that users continue to use this added layer of security during login to maximise their protection. Click the Site Permissions tab. 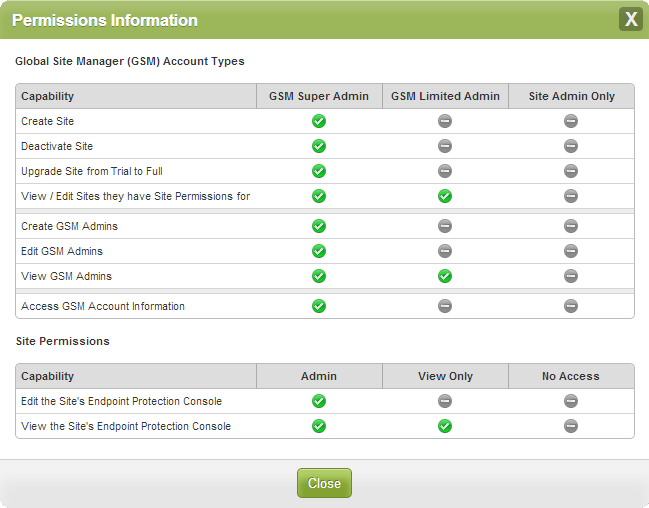 The system displays the Permissions Information panel.